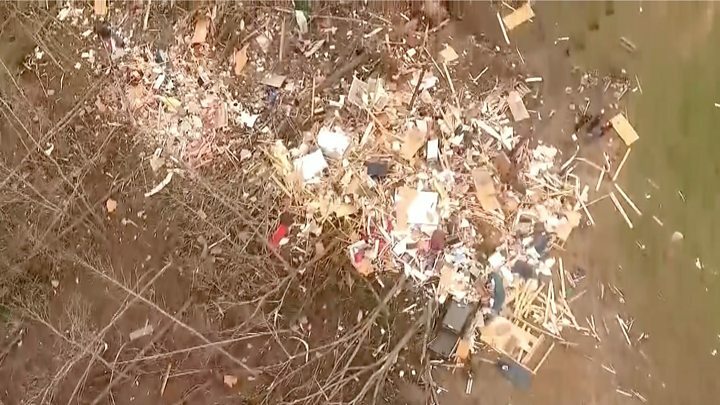 At least three children have died in eastern Alabama after two tornadoes caused extensive damage to buildings and roads, rescue officials say. At least 23 people are known to have died in Lee County, with the youngest believed to have been six years old. There are fears that the death toll will rise as emergency crews dig through rubble. Dozens more are hurt. The sheriff of Lee County, Jay Jones, told local media that the devastation caused by the winds was "incredible". He said: "It looks like someone has taken a giant knife and scraped the ground. There are slabs where homes formerly stood, debris everywhere... whole forested areas with trees are snapped and lying on the ground... a lot of devastation out there." Lee County coroner Bill Harris said on Monday that at least three children - aged six, nine, and 10 - were among the dead. Taylor Thornton was named as one of the young victims. Her school, Lee-Scott Academy, announced the news on Monday and directed people to an online fundraising page to support her family with funeral expenses. "She never met a stranger - everybody was a friend," her uncle James Thornton told Reuters news agency. "She had a huge life at 10 years old. She had a footprint bigger than most people who are 70, 80, 90 years old." Six-year-old AJ Hernandez Jr was also identified by family members on social media, with his aunt calling him a "precious little man". Image caption Taylor Thornton was listed among the dead. "I will miss your little smile and your sweet voice and face," Tina Melton wrote on Facebook. "He was always eager to give hugs and loved his family." Nearly 2,000 homes in the affected area are without power following the tornadoes. A state of emergency is in operation, with resources from across Alabama pouring into the affected area. Drones with infrared capability are being used in an attempt to find survivors. Where did the tornadoes strike? The area around Beauregard, about 60 miles (95km) east of Alabama's state capital Montgomery, appears to have borne the brunt. The tornadoes there struck at about 14:00 (20:00 GMT) on Sunday, carving a path at least a half a mile wide and at least a mile long. Footage of the aftermath shows snapped communications poles, roads littered with debris and wrecked houses. The National Weather Service (NWS) made a classification of at least EF-3 - meaning winds of up to 165mph. Residents of Smiths Station told local TV they had seen businesses destroyed there. A large bar called the Buck Wild Saloon had its roof torn off. A sign from a flea market in Lee County was found 20 miles away in Hamilton, Georgia. What do we know about the casualties? All of the deaths reported so far have been in Lee County. Authorities say they are still working to identify the victims and the injured. "We've never had a mass fatality situation, that I can remember, like this in my lifetime," Lee County coroner Bill Harris said. Alabama meteorologist Eric Snitil tweeted that there had been more tornado deaths in Lee County in one day than in the whole US during 2018. Several people were reported hurt in Talbotton in Georgia, though none seriously. Alabama Governor Kay Ivey posted on Twitter to warn residents there could be more extreme weather to come. "Our hearts go out to those who lost their lives in the storms that hit Lee County today," she wrote. President Donald Trump tweeted: "To the great people of Alabama and surrounding areas: Please be careful and safe... To the families and friends of the victims, and to the injured, God bless you all!" Apple CEO Tim Cook, who was born in Mobile in the south-west of the state, said he was "devastated" by the news, saying Lee County was "a place close to my heart". Are tornadoes expected at this time of year? This series has occurred earlier than the traditional peak season for tornadoes, which runs from April to June, when more than half of the year's tornadoes generally strike. Weather systems are more conducive in these months. Warm air flows north from the Gulf of Mexico at the same time as storm systems are propelled into the south and mid-west by a southward dip in the jet stream. These latest tornadoes appear to have caused the highest death toll since 35 people were killed in Arkansas and Mississippi in April 2014. A "super outbreak" of tornadoes across a swathe of the US in April 2011 killed more than 300 people.